At this time of year, foodbanks are crying out for help and as such we are asking our fans to support a collection at the ground on Saturday 6th December 2014, at our home game against fellow Saints St.Johnstone. We were delighted with the response we received from kind hearted buddies when we supported Renfrewshire Foodbank in March this year and hope to smash our previous best with your support. Together we can help feed people in need and build a stronger community in Renfrewshire. All donations welcome from all Saints, including the Perth Saints. Come on ye Saints ! The mailing to season ticket holders to launch this years winter lottery went out Monday 27th October,2014. The lottery prizes are £1,000 first prize, £500 second and £250 third. Counterfoils have to be returned by 13th December,2014 with the draw being made at the Motherwell home game on the 20th December,2014. Pre paid enevelopes have been supplied in the mailing for cheque returns and both the club reception and collection boxes at the food kiosks (matchdays) will be available for cash and cheque returns, but please do not post cash in the mail. friendly environment on match days. With the help of our fellow supporters, The Fans Council are planning to raise funds via the lottery to hire a marquee for our home match against Motherwell on 20th December,2014. Our plans include a bar (licence appoval pending) and TV’s and playstations. To efficiently manage numbers we will be asking supporters to register online to confirm their attendance at supportsmfc@hotmail.co.uk. The present chairman Alan Wardrop who has completed one year of service has intimated that he is prepared to stand down if any other member wishes to fill this position. If no other members put themselves forward for election Alan is quite prepared to continue as Chairman for a further year. The present vice chairman Eric Crossan who has completed one year of service has intimated that he is prepared to stand down if any other member wishes to fill this position. If no other members put themselves forward for election Eric is quite prepared to continue as Vice Chairman for a further year. election Sarah is quite prepared to continue as Minute Secretary for a further year. The present treasurer Allan Gallacher has now completed two years of service and must now stand down in terms of our constitution. Allan has intimated that if there are no other members wishing to fill this position he is prepared to stand for re-election as treasurer for a further year. Should any members wish to be considered for any of the above executive positions as outlined above then they must register their interest with the present Chairman prior to our next committee meeting on Thursday 23 October 2014. The Annual General Meeting of the St.Mirren Fans Council has been announced in line with it’s constitution. The date has been set as Thursday 27th November,2014 at the stadiums corporate dining area, with a 7pm start. Entry is via the clubs main reception. All St.Mirren supporters are invited and welcome to attend. After the initial procedures for electing committee members, the evening will be an opportunity to hear a summary of the years acheivements to date and the plans for the future. We would be grateful if you could e mail and confirm your attendance in advance to allow us to manage numbers. Please e mail awsaints@btinternet.com to confirm your attendance. The St.Mirren Fans Council are hosting an open day for our supporters to meet the new and existing players in an open day in conjunction with the club. The day will start at 12.00 pm with a training session completed by the first team squad finishing at 1.00pm. Access to the training session is via the West Stand. After the training session the players will be available to meet and give supporters the opportunity for photo’s. The Fans Council are offering a rare photo opportunity with The Renfrewshire Cup for a small fee of £5 with proceeds shared with the clubs Youth Development Programme. Other photo oportunities include the “head boards” which have proved popular at the Family stand at the final match of the season. Community coaches will offer the youngsters a skills session including a “beat the Goalie,” a skills test zone and measure the strength of your shot on the Powershot equipment. The club shop will be open and The Paisley Panda will add to the fun of the day. The afternoon finishes at 3pm and is FREE and open to all Saints supporters. A GREAT WAY TO SPEND QUALITY TIME WITH YOUR HEROES ! Jim Goodwin & Steven Thompson share a joke at last years golf day out at Paisley Golf Club. 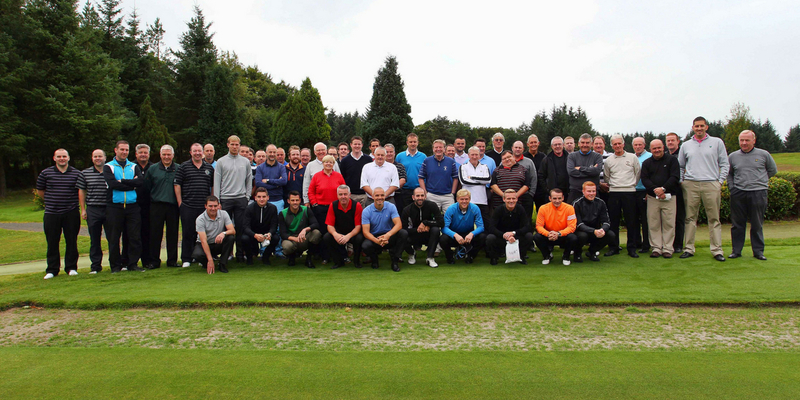 This years golf day will be on Friday 5th September,2014 at Paisley Golf Club. If you and two friends apply we will hook you up with a Saints representative to make up the four ball. To register your interest please e mail Fans Council Vice Chairman Eric Crossan at eric.crossan@talktalk.net for further details. Saints Fans Council members Eric Crossan, John Allison and Calum Wardrop get the wheelie bins moved in to place for the food gathering at the Hibs game. It was a great result on and off the park with a full minibus of food collected by generous buddies as well as a fantastic 2-0 home win. The day was such a success more collections are planned for Easter and Christmas when families could really do with the additional help of the Renfrewshire Food Bank. 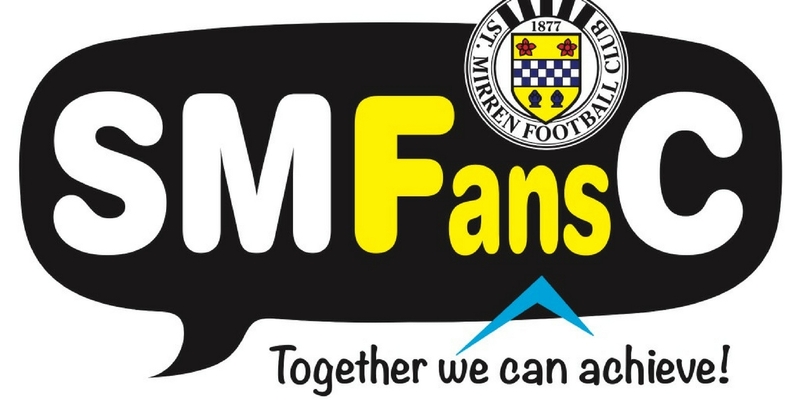 On behalf of The St.Mirren Fans Council, St.Mirren Charitable Trust and Renfrewshire Food Bank we would like to thank our kind hearted supporters for their generousity. This event was a St.Mirren Charity event supported by The St.Mirren Fans Council. It’s almost one year on from our historic cup win and what will forever more be remembered and known as “St.Mirren’s Day” to all loyal buddies. With this in mind we are aware many of the towns bars and retailers plan to turn the town black and white for the weekend and we at the Saints Fans Council want to do our bit. An added bonus is the support of the club with current Cup winning players attending and captaining your quiz team. Teams will consist of teams of ten,but don’t worry if you have a smaller group or want to come along on your own, as all Saints fans are welcome and we will team you up with other like minded Saints supporters on the night. Tickets are priced at £7 and includes one drink at the bar and a finger buffet. Due to licensing laws this event is restricted to over 18’s only. Ticket sales will finish on Thursday 13th at 5pm to allow us to finalise numbers for the catering.Based on previous similiar events we have arranged we expect the evening to be a sell out. Tickets are on sale from the clubs main reception and ticket office up until Thursday 13th March at 5pm. The photo’s taken by official club photographer Allan Picken, at the above event are now ready for collection from the clubs main reception. Many thanks to all the wonderful young Saints Supporters who turned up in their numbers wearing the famous black and white stripes. The day was a huge success and the Fans Council appreciate the many e mails and comments congratulating us on a great family day out. We could’nt have done it without the help of the Club, Community Coaches and of course the players who signed autographs all afternoon. At our Boxing Day game against Dundee United, former Saint Ricky Gillies drew the winning numbers for the The St.Mirren Fans Council winter lottery in support of the clubs Youth Academy. This lottery’s aim is to help raise funds for the St.Mirren Youth Academy where players such as John McGinn,Jason Naismith, Sean Kelly and Kenny MacLean have progressed. First Prize is Joe Campbell’s winning ticket for £1,000 ! Pictured below is April lottery winner Jim Kinning, receiving his prize from our ” loan king,” Isma Goncalves. Sunday 22nd September,2013 was a very special evening to celebrate and remember our historic League Cup Final victory with the players and management who made it all possible. Gary Teale, Marc McAusland, Paul McGowan, David Van Zanten and John McGinn who all entered into the spirit of the evening by sharing special memories of the day with Marc McAuslands story about his Dad Brian, bringing a tear to a glass eye. The format involved playing highlights of the semi final win against Celtic and the euphoria of the Cup Final win against Hearts with a Question and answer session involving the supporters. back Danny and the team. Many thanks to the 130 supporters who attended and made the night a sell out. Special thanks to compares Harry Millan, Phil Clarke and club representatives Campbell Kennedy and Brian Caldwell. These events don’t happen by their own and Fans Council members who organised the event were Alan Doak,Fraser Burns and Allan Gallacher, who deserve great credit for their efforts to ensure everyone had a great night. The event raised over £2,500 and the proceeds will be shared between the club and the Saints fans Council for council projects and initiatives for the benefit of all Saints fans. It was great example of how St.Mirren supporters back their team ! Friday 6th September was the St.Mirren Fans Council’s Club Golf Day in aid of the St.Mirren Youth Development Programme. Players and staff including Club Captain Jim Goodwin and local heroes Steven Thompson and Marc McAusland, played a round of golf with Saints loyal supporters to raise funds for the clubs youth development programme. Paisley Golf Club was the venue and their staff could not have looked after the fans and players any better with Paisley Golf Club professional Andy Carlton worthy of special mention as well as the excellent catering staff. There were various prizes up for grabs on the day including hospitality for 4 at St.Mirren Park, kindly donated by club Commercial Manager Campbell Kennedy. Pictured above are Jim Goodwin and Steven Thompson having a laugh on the practice green.Marc McAusland’s winning team including supporters Ian Wilkie,Paul Baird and Scott Mackenzie and a Group pic of all supporters, players, management and directors who competed on the day. The day raised an impressive £1,423 for the Saints Youth Development Programme and a great day was had by all ! To all those who kindly took a team on the day, many thanks for your support of the Saints Youth Academy. Monday’s holiday gives both fans and players the ideal chance to celebrate our recent national Cup Final win and allow fans the opportunity to attend an official club training session at the ground. Training commences at 10.15 am to 11.30 am. and entry is FREE via the West Stand. From 11.00am to 12.00 noon players will be available for autographs and pictures. There is also the opportunity for supporters to have their picture taken by official club photographer Allen Picken with the Scottish Communities League Cup Final Trophy, with the added bonus of standing on the podium our heroes graced at Hampden. Pictures will be taken in the new dome from 11.30am to 1.30pm. Prices for a 10 x 8 photo are £5 if uplifted at the ground or £10 if posted out. There is also an e mail option at £5. Attendance is free and there will be a range of family activities including “The Power Shot” which measures the strength of your shot as well as a “beat the goalie”. The Pandas will be there for the kids (and some adults) so make sure you come to St.Mirren Park for a fun bank holiday.